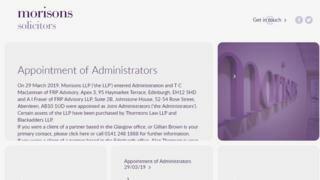 The Scottish legal firm Morisons LLP has entered administration. The legal partnership, which had offices in Glasgow and Edinburgh, was founded in the 1860s. In the past decade, it had absorbed other businesses, including Maxwell McLaurin, Macrae Flett and Rennie, and Bonar Mackenzie. Morisons is believed to have had about 20 partners and 100 staff. Some of its assets have been bought by Thorntons Law LLP and Blackadders LLP. Insiders have told the BBC there could be significant numbers of redundancies, as few other firms are currently expanding.